MyMindset Blog: Gratitude for the Science Geek - With a Little Woo Woo on the Side! Gratitude for the Science Geek - With a Little Woo Woo on the Side! Gratitude isn't a new mindset. In fact, the way we talk and think about gratitude has become almost cliche. Every other magazine article and self-help guru seem to be encouraging an 'attitude of gratitude.' WHY? What is all this gratitude hoopla about? Turns out there is scientific research showing the benefits of gratitude. And if you are anything like me - a combination of straight up hippie woo-woo and science geek - you like to know there is something quantifiable and factual to support the good vibe you are seeking. In fact, there is A LOT of research on the benefits of gratitude. I am not going to talk about each of the studies highlighted below - instead see the links below with a brief explanation next to each one. These represent a tiny fraction of what is out there. Check them out, read the data and research, observe the findings, and when you feel like you have enough evidence, read on and I will share my favorite reasons to adopt a mindset of gratitude! Finally, sign up for a FREE TRIAL of MyMindset this week and experience a daily dose of gratitude questions, quotations and coaching! 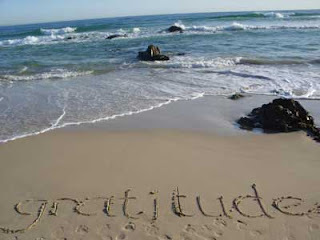 Gratitude magnifies positive emotions and calls us to celebrate what IS, which helps us be more present. Gratitude allows you to notice what is around you. Gratitude encourages you to release control by reminding us to accept life as it is and be grateful for what we have. Gratitude is an amazing and effective antidote to comparing your life to someone else's. It reminds you that you don't need to 'measure up' to a standard set by our families, friends or the media. You are exactly where you need to be. Gratitude is a reminder that you get to choose how you translate your life. You always have a choice about how you look at things or how you 'spin' things. Choose gratitude. When we choose a mindset of gratitude we are letting the people around us know that we are open to growth, change and possibility. It helps you be open to opportunities, more gratitude, positive energy and new ideas. What inspires YOU to adopt a mindset of GRATITUDE? Share your stories at support@mymindset.com.We would love to share them in a future blog post! Could YOU or someone you know benefit from a mindset of GRATITUDE? This week would be the perfect time for a FREE TRIAL of MyMindset.com's Daily Questions (each one inspiring you to adopt a mindset of gratitude), Inspirational Quotations and Professional Coaching Support! Click Here to request an invitation for you or a friend today! Hannah Hollett is a MyMindset Coach as well as a parenting, life and business coach. She can be reached for question, comments or a complimentary personal coaching consultation at hannah.hollett@myMindset.com.